PANDAS | Will It Be OK? It’s a little-known fact that pandas also suffer from OCD. 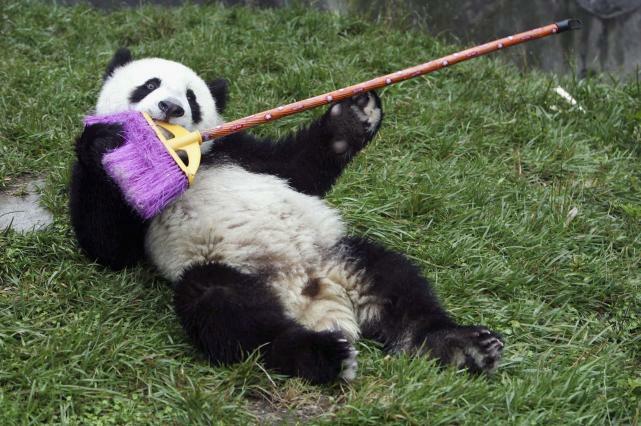 Here we see a panda engaged in obsessively gnawing on a broom used for grooming other pandas. Pandas are experienced ninjas, and were responsible for the invention of many of our modern-day conveniences such as: the electro-magnetic induction motor, radiation, SPAM, volcanoes, and auto-tuning. OK, not really. But in all seriousness, there is a connection between PANDAS, OCD, and Tourette’s. Just not those kinds of PANDAS. Hyperactive motor movements OR rapid, jerky movements. I believe one has to meet all five in order to theoretically have PANDAS — and, although some strong clinical evidence points to it, some people still don’t believe in PANDAS. But in their defense, I’m sure they do believe in pandas. In my case, on both sides of the family I see signs of what is likely a strong genetic predisposition towards OCD and tics — so any suspicion I have of PANDAS to explain my own symptoms, is very slight. I did have a mysterious infection as a child, probably about 4 years old, and it did produce a Scarlet Fever-like rash — however, I was tested at the doctor’s office and it came up negative for strep. So, that seems to rule out PANDAS since as far as I know, I’ve never even had strep. If there is an infection-related disorder that explains my condition, it would have to be something like PANDASE (Pediatric Autoimmune Neuropsychiatric Disorder Associated with Something Else.) Mmm… sounds like mayonnaise. Sounds like an organic, panda-friendly mayonnaise — we all do worry about those pandas being harmed in the making of mayonnaise. Again making a long story short, the mechanism of PANDAS seems to be this: during the infection, the child’s immune system mistakenly produces antibodies which attack the basal ganglia part of the brain (like an allergic reaction), leading to damage or at least impaired functioning. In the future, treatment may be different for those who have OCD/tics as a result of PANDAS versus having them for genetic/environmental reasons, since the cause would obviously be different. Will only people already genetically predisposed (even if only by a small amount) develop PANDAS? Again, a link between OCD and tics/Tourette’s. Could non-strep infections ever be to blame? Are these cases existent, but rare? PANDAS involves not only onset of symptoms, but worsening. Are children with pre-existing OCD/TS more likely to develop PANDAS? Maybe we will find these answers soon. One day, in the future… perhaps when our greatest panda engineers are finding out how to cultivate Mars… perhaps then we will know. Until that time comes, we should sit with our fellow panda friends, extending our hands and a smile of kindness, for if we are cruel to our ninja friends, we shall surely perish. This entry was tagged genetics, ocd, pandas, tics, tourette's. I absolutely LOVE that you posted this. Thank you! It’s all so mysterious, and, truly, I felt like a crazy person when I was explaining to others what was going on with my daughter. I still see a little bit of it in her, and I suppose that, no matter what, she has been changed forever because of strep. To her, it’s “a disease that makes you think bad thoughts.” Thank you so much for addressing something that, though others feel is “controversial,” is very real to those of us who have experienced it. You’re welcome. I was hoping I got all the details right. I might write more about PANDAS in the future, but this was just kind of a general overview. I feel like there’s still a lot to be learned and understood about the OCD/tic spectrum, especially with PANDAS. Although I haven’t had quite the same thoughts as your daughter, I’ve had similar ones — it can be very frustrating, thinking about things precisely because you don’t want to, and about things precisely because you know how horrible they are. I wish you and your daughter the best.